The first batch of ice cream I made from Jeni's cookbook was Gucci Muu Muu, which is essentially a chocolate-based ice cream with curry and toasted coconut. 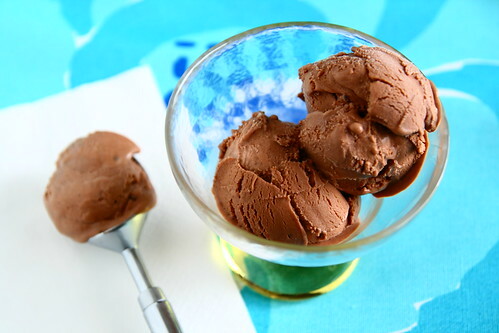 Ever since then, I had wanted to use the base recipe to make a chocolate wasabi ice cream. The inspiration came from the time I visited Oh Yeah! in Shadyside and had a chocolate soy ice cream with wasabi mixed in. I wasn't crazy about the ice cream itself, but I thought the flavor combination was fabulous and something to try at home. I wanted to emulate Jeni's ice cream as much as possible, so I ordered some chocolate bars and cocoa powder from Askinoskie in Missouri. I was pretty sure this would make for a great chocolate ice cream base as I'm totally in love with Jeni's Askinoskie Dark Milk Chocolate Ice Cream. I followed the basic recipe for Gucci Muu Muu (p. 158), but instead of 1 tablespoon of curry powder I used 1 tablespoon of wasabi powder. I also skipped the toasted coconuts. Unfortunately, as the batter was churning, I discovered that there had been a misprint in the recipe so I did not use nearly enough heavy cream as I should have! :( This also explained the thick consistency of my Gucci Muu Muu ice cream when I first made it. Even though the ice cream still tasted good, it really wasn't the right balance of flavors I was hoping for. Besides, I wanted to include this ice cream on the menu for my ice cream social, and most of my guests had only heard me rave about Jeni's but had never had the ice cream before, so I was particularly motivated to do right by Jeni and make the ice cream the way I should. My guests were quite intrigued by the chocolate wasabi combination and I think they enjoyed the ice cream. Along with Chocolate Wasabi, I had also served homemade Mint Oreo and Basil ice cream, in addition to several of Jeni's commercial flavors. The ice cream certainly made for a successful evening! This is part of a series of posts on recipes from or inspired by Jeni's Spendid Ice Creams at Home. The rest of the series may be found here.